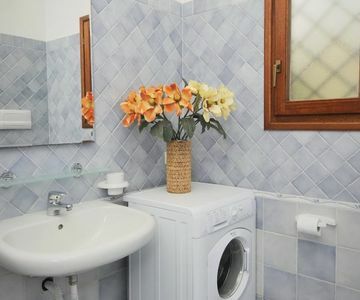 "Le Canne Bilo 3", 2-room apartment 38 m2. Renovated, simple and beautiful furnishings: living/dining room with 1 double sofabed, dining table and digital TV. 1 double bedroom with 1 double bed. Kitchenette (4 hot plates). Shower/bidet/WC. Balcony or small garden. Terrace furniture, sitting area. Please note: suitable for families. 1 small pet/ dog allowed. TV only IT. Modern, beautiful residence "Le Canne". In the centre of San Teodoro, in a quiet, sunny position, 500 m from the sea. Parking (limited number of spaces). Shop, grocery, supermarket, shopping centre, restaurant, bar, bakery 700 m, sandy beach"La Cinta" 500 m. Indoor tennis centre, sports centre, children's playground 700 m. Please note: the photograph shows a typical example. After you successfully submit your reservation request, you will receive an e-mail response from the home owner or property manager, within the next 24 hours. At this point, the full details of your confirmed reservation including the address of the property and the contact details of your local host will be shared with you through e-mail. We hope you have a pleasant stay!